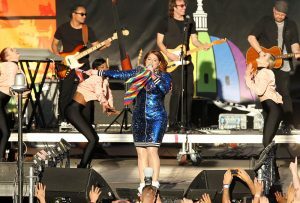 After many awoke to the horrific news out of Orlando, Florida this morning that 50 people had been killed inside of the Pulse Nightclub, that wasn’t going to stop all of those in attendance in Washington, D.C for the 2016 Capital Pride Concert from spreading the message that LOVE trumps HATE. Many people donned signed with the State of Florida and Orlando Strong throughout the crowd to show their support. With the increased police presence, the event remained very calm and everyone seemed to rally more support for those killed with her amazing performance. Just one night before both artists paid tribute to Voice Star Christina Grimmie, who was sadly gunned down at her Meet and Greet, also in Orlando. “I was reading the news last night, and I found out that my good friend Christina Grimmie was killed, and I want to dedicate this song to her tonight,” he said before playing “See You Again.” “I’ve been upset about this all day, mainly because I just never got to say what I wanted to say to her. And I think this song perfectly captures that, said,” Puth at his concert the night before.